Dasatinib is an orally bioavailable synthetic small molecule-inhibitor of SRC-family protein-tyrosine kinases. Dasatinib binds to and inhibits the growth-promoting activities of these kinases. Apparently because of its less stringent binding affinity for the BCR-ABL kinase, dasatinib has been shown to overcome the resistance to imatinib of chronic myeloid leukemia (CML) cells harboring BCR-ABL kinase domain point mutations. SRC-family protein-tyrosine kinases interact with variety of cell-surface receptors and participate in intracellular signal transduction pathways; tumorigenic forms can occur through altered regulation or expression of the endogenous protein and by way of virally-encoded kinase genes. Bristol-Myers Squibb Company today announced that the U.S. Food and Drug Administration accepted its supplemental Biologics License Application for Sprycel (dasatinib) in combination with chemotherapy for the treatment of pediatric patients with newly diagnosed Philadelphia chromosome-positive acute lymphoblastic leukemia. Mayo Clinic researchers have reported a causal link between senescent cells - the cells associated with aging and age-related disease - and bone loss in mice. New University of Liverpool research, presented at an international conference, confirms that a novel approach to the treatment of chronic myeloid leukemia (CML) can safely increase treatment success and reduce negative side effects. Mayo Clinic researchers have uncovered three new agents to add to the emerging repertoire of drugs that aim to delay the onset of aging by targeting senescent cells - cells that contribute to frailty and other age-related conditions. A Mayo Clinic study has shown evidence linking the biology of aging with idiopathic pulmonary fibrosis, a disease that impairs lung function and causes shortness of breath, fatigue, declining quality of life, and, ultimately, death. 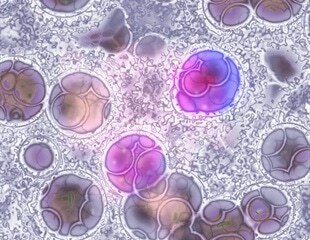 A late-breaking abstract being presented today during the 58th American Society of Hematology Annual Meeting and Exposition in San Diego identifies inherited genetic mutations in the gene IKZF1 that confer a higher likelihood of developing pediatric acute lymphocytic leukemia (ALL). Research demonstrates the continuing role of allogeneic stem cell transplantation as a salvage option for patients with chronic myeloid leukaemia who progress to accelerated phase or blast crisis after tyrosine kinase inhibitor failure. Patients with high-risk chronic myeloid leukaemia who undergo allogeneic haematopoietic stem cell transplantation may benefit from continuing with tyrosine kinase inhibitor therapy, US clinicians believe. Final DASISION study findings confirm dasatinib to be an effective, long-term treatment for patients with a new diagnosis of chronic phase-chronic myeloid leukaemia. The first-line treatment and monitoring of patients with chronic phase-chronic myeloid leukaemia is in accordance with the European LeukaemiaNet recommendations, finds a real-world clinical practice study. Treatment-free remission may be feasible in many patients with chronic myeloid leukaemia, say researchers who set out clinical and logistical requirements for discontinuing tyrosine kinase inhibitor therapy. Calculating halving time of the BCR-ABL transcript after 3 months may help determine prognosis in chronic myeloid leukaemia patients undergoing first-line tyrosine kinase inhibitor therapy, say researchers. The increased risk of vascular events observed among elderly patients with chronic myeloid leukaemia, compared with patients without cancer, may not be driven by tyrosine kinase inhibitor therapy, US researchers suggest. A meta-analysis highlights the significantly increased risk of vascular occlusive events in patients with chronic myeloid leukaemia using some new-generation BCR-ABL tyrosine kinase inhibitors compared with use of imatinib.